This island ranks #3 of the "Best Andaman Islands"
Most hotels are located near the town of Port Blair. In general, you can easily rent a room anywhere in the island. Fly to Andaman Islands International Airport (IXZ). Most of the neighboring islands are connected by ferries, and getting from one island to another looks like you just crossed the river. 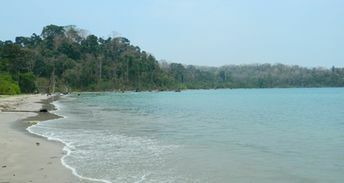 The best time for a holiday in the Andamans is a dry season in the winter half of the year.